George Lazenby has always pushed himself to the limit. His confidence, pride, striking good looks, and charm made him a natural choice to become the successor to Sean Connery as James Bond. Growing up in Australia, George Lazenby always dreamed big. He moved to Canberra in his teens and through sheer perseverance became the leader of a rock 'n' roll band as well as a booker for larger acts coming from Sydney. Recalling that early success, Lazenby relates it to his one performance as 007: "I was basically doing it just to get out there. I didn't know I wanted to be an entertainer at the time. But, what was in the back of my mind, I guess was to show off, to be somebody. And that's why, I think, when Bond came up, the odds were I'd get it because I wanted it more than anybody else." Lazenby came to London to reunite with a girlfriend, but by the time he arried, she had moved on. He lined up a car salesman job and then advanced to selling Mercedes on Park Lane in London. His looks gained the notice of photographer Chard Jenkins. Soon, Lazenby was one of the highest-paid male models in Europe. He starred in a series of television commercials for Big Dry's chocolates, which made his face recognizable around the UK. A chance blind date with casting director Maggie Abbott led her to suggest he try out for James Bond. Lazenby liked the idea of playing Bond, and he set about becoming the perfect candidate. "People think: Let's go and see a Bond film. It's always entertaining." Lazenby purchased a suit that had been made for Connery in You Only Live Twice (1967) but was never used. At the Dorchester Hotel, Lazenby visited Kurt the Barber and asked for a haircut like Sean Connery's. It turned out producer Albert R Broccoli was in the next chair, but Broccoli thought Lazenby was simply a businessman. Sporting a Rolex watch like 007's. Lazenby appeared at the door of the casting director's office saying "I heard you were looking for James Bond." After a meeting with producer Harry Saltzman, Lazenby confessed to director Peter Hunt later that he had no real acting experience. Hunt told him that if they stuck together, he could turn him into the new Bond. During a particularly energetic screentest, Lazenby bloodied the nose of stuntman Yuri Borienko. Bond producer Harry Saltzman walked over and told him, "We're going with you." Producer Cubby Broccoli wrote in his autobiography When The Snow Melts: "Lazenby, in my judgement made a good James Bond. He could easily have fallen into the trap of doing a smart but fatal imitation of Sean. Instead, he fought his corner as a fledgling actor, avoided tricks and gave a supprisingly effective performance." The aftermath of On Her Majesty's Secret Service was difficult for Lazenby. He failed to capitalize on the effort he had put into playing Bond. Following what he now feels was some very bad career advice, Lazenby walked away from any chance he had to return as 007. "At the time, I didn't know how big James Bond was. I didn't realize that no one's going to treat you the same again," Lazenby recalled. "All the doors open for you. I had that experience, and it was kind of fun. Later on, the opposite happened. They all closed. That was another part of my life that I had to endure that wasn't so much fun." "It's hard to top a Bond film. There's nothing bigger." He co-wrote, executive produced, and starred in the film Universal Soldier (1971), which died at the box office. 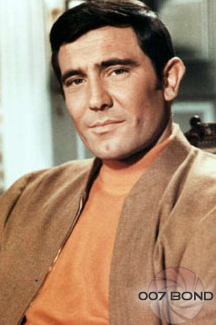 By the mid-1970's, Lazenby was returning to Bond in a way. He appeared in a stylish commercial for Sony, playing a secret agent impressed by the technological wizardry of Sony's off-the-shelf products.Lazenby subsequently played Bond-like characters in several films and television shows, but he also demonstrated real strength as an actor, a strength that has all-too-rarely been tapped. He played a US senator in Peter Bogdanovich's moving film Saint Jack (1979) and appeared as General Pettigrew in Gettysburg (1993). Lazenby has played Superboy's father Jor-El, as well as providing the voice of the Batman villain King in the Batman Beyond television series. Outside of acting, Lazenby has been tremendously successful in real estate and sports, particularly off-road motocross racing.